Trent Nelson | The Salt Lake Tribune Jerry Benson smiles after being sworn in as the new president/CEO of the Utah Transit Authority (UTA), Wednesday August 31, 2016. 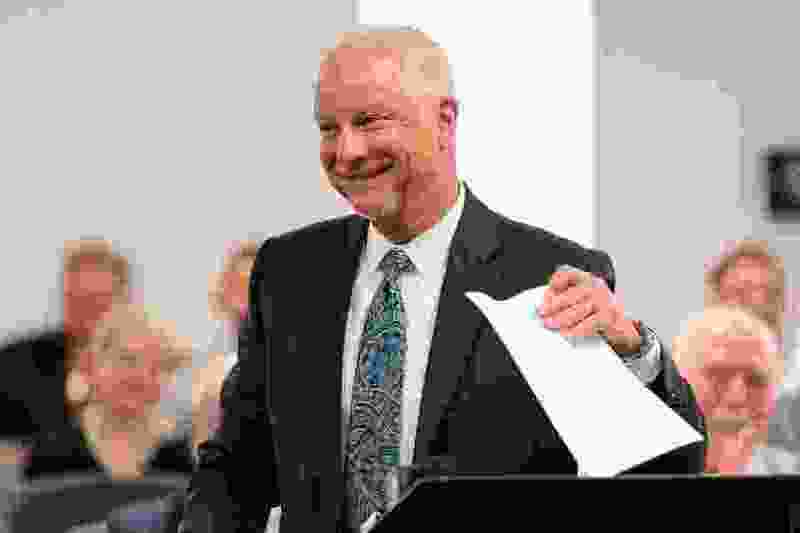 Two key legislators said Thursday that the Utah Transit Authority Board is fibbing or just flat out wrong with its claims that a new law requires the agency to fire its president and CEO, Jerry Benson. “I find it perplexing for them to say we are forcing him out through this bill. 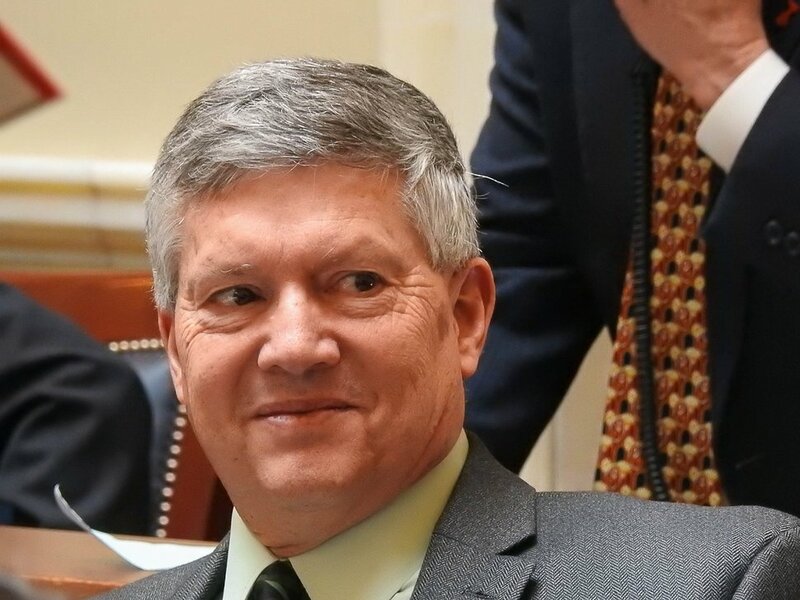 That is not correct,” said Sen. Wayne Harper, R-Taylorsville, sponsor of SB136 that restructures the transit agency. Rep. Mike Schultz, R-Hooper, the House sponsor of the bill, said he and Harper had told the agency “for months, and really from Day One” that the law would allow Benson to continue for at least several more months in his job. The lawmakers aired their criticisms a day after the UTA Board on Wednesday announced it is terminating Benson effective May 7, just before SB136 takes effect. Board members said a close reading of the new law restructuring UTA shows the agency cannot employ a president, CEO or general manager once it takes effect — and Benson holds all of those titles. The law also will replace UTA’s 16-member, part-time board with three full-time trustees appointed by Gov. Gary Herbert effective Nov. 1 or earlier. That new board will then be able to hire a new executive director to guide the agency. But Harper and Schultz say the law allows hiring an interim director until the new board chooses a permanent one — and they told UTA they figured and hoped that Benson would take that role. Harper said that should not be a surprise to UTA, and he cannot figure why it made contrary claims. “In a meeting as recently as three weeks ago, I communicated directly to Jerry Benson and a couple others in the room my desire for him to stay on because he’s an invaluable resource needed through this transition,” Harper said. It added, “It’s possible that Jerry could have remained as interim executive director. But the executive director’s responsibilities and authority (reduced authority, executive team now reports to the board, etc.) are very different” from the job now. “Taking all of this into consideration, the Board of Trustees and Jerry mutually agreed that this was the best course of action to clear the slate for new leadership to move the agency forward,” the board statement said. Harper and Schultz questioned why UTA would make what they say are false or misleading claims — and for a time questioned if Benson’s contract might give him a more lucrative severance if he were terminated “without cause” than if he merely retired or quit. UTA said that is not the case, and provided a copy of Benson’s 2016 contract. It gives him nine months of severance when he leaves for any reason — unless fired “for cause” or in the case of death. In 2017 Benson received $376,000 in compensation for the full year — $238,169 in wages, $35,812 in paid leave and $102,023 in benefits. Schultz was critical not only of the decision to terminate Benson, but of the way it was done. The UTA Board called a special meeting for Wednesday — but Benson’s employment status was not openly on the agenda, although it said a closed session was scheduled. Benson’s termination agreement was discussed behind closed doors, and voted on afterward. Based on statements UTA issued later, Schultz said he worries the Board approved Benson’s severance agreement based on the belief that SB136 forces firing him “and that’s just not accurate.” He also said he worried the board was pressured into quick action without time for it and the public to review details at length. 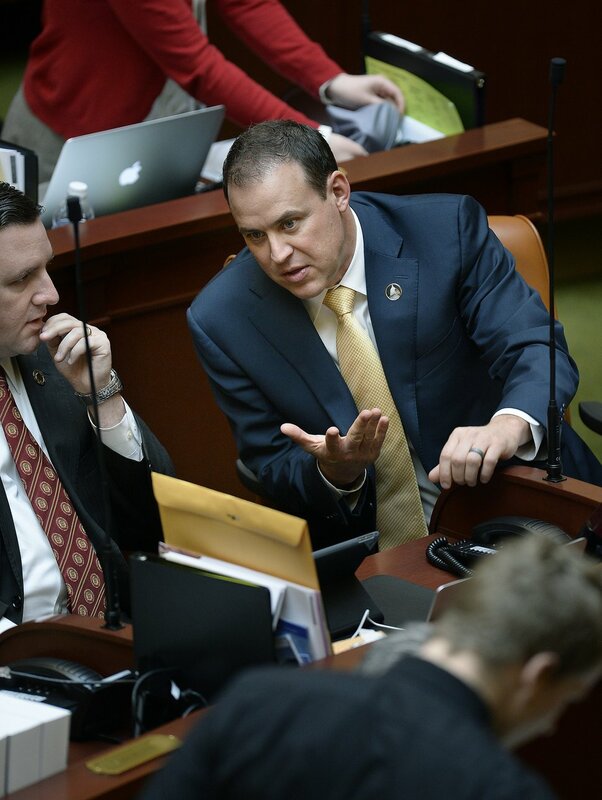 Scott Sommerdorf | The Salt Lake Tribune Rep. Mike Schultz, R-Hooper, right, leans in to speak with Rep. Robert Spendlove, R-Sandy, in the Utah House of Representatives, Wednesday, January 28, 2015. “This is exactly the sort of thing we tried to stop from happening” with the bill restructuring UTA, Schultz said. SB136 was passed because of a variety of scandals and controversies through the years, including secretive actions and meetings by the board in the past. UTA and prosecutors announced a year ago that the transit agency was given immunity in an ongoing federal probe into former officials — including scrutiny of its real-estate deals. UTA agreed to submit to several years of federal oversight and pledged cooperation with investigators.